It’s been a while, but last Friday, I did something stupid worthy of another post. I was lucky enough to receive my new team bike the weekend before this fateful day. It’s a beautiful Starley JKS R1 which has been painted to limited edition team colours and I absolutely love it. Starley are a British manufacturer and they are joint title sponsors of my Starley Primal team. 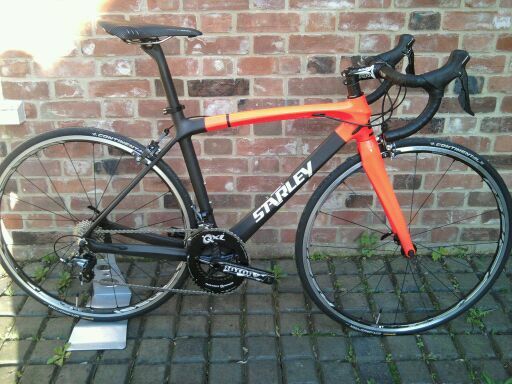 Here’s their website: http://www.starleybikes.com. Stella and I have high hopes for this season. Unfortunately, our first foray into the world wasn’t particularly successful. It took me a little while to have the time between work and training to get her all set up and ready to ride, so this fine Friday evening, the sun was out, the pedals were on and it was time for our first ride together. The first part of any ride from my house, begins with a short, sharp climb out onto the drive. The short run-up to the climb is just enough to get clipped in and do a quick gear-shift if I’m in too tough a gear before I hit the climb. On this particular occasion, I clipped in and realised I needed to shift down into an easier gear (ok, don’t shoot me if I got the down and up shift wrong – I needed an easier gear, that is all). I need to give you a bit of background now: On my old race bike is set up with Campagnolo 11 speed. My lovely Stella, however, is Shimano 11 speed. Those of you who are au fait with the difference in gear shift on these two may have already guessed what happened next. Those that haven’t got a clue (that would usually include me), read on. So, I clipped in and pushed off. I immediately realised I needed an easier gear (now avoiding the shift up/down terminology) in order to make it up the hill, and quickly shifted across a couple of gears. Unfortunately, I had completely forgotten that Campag uses a shift across for an easier gear and a thumb shift for a harder gear, Shimano uses a single leaver shift across for a harder gear and both gear and break leaver shifts across for an easier gear. I basically ended up shifting onto an 11 tooth. With Stella having started her climb with the momentum from the first couple of pedal strokes, I was now in a position where I didn’t have enough strength to turn the pedal in such a high gear on such a steep gradient, but I also couldn’t put enough pressure on either pedal in order to unclip, without over-balancing the bike. I was stuck in a sort of track-stand at the start of the hill (I have never been able to do a track-stand before), but I couldn’t move forward, backward, or unclip. The road is even too narrow to bunny-hop round in a circle in order to roll forwards down the hill again (not that I posses such technical skills). So I was stuck in limbo and there was only ever going to be one way out of this. The most embarrassing slo-mo fall that all cyclists who use “clipless” pedals will experience at least once in their lives. The only choice I had was which side I was going to fall on. As I toppled over sideways, all I could think was that I needed to protect Stella, so I twisted my body to be between the ground and my bike and took the hit. I’m now lying on the floor, under my bike, but the problem hasn’t ended here. I’m still clipped in! Try lying on the floor whilst clipped into your pedals and try and get out (ok, just imagine). It’s like trying to stand up with skis on. In the end, I managed to unclip each foot without grazing the bike across the floor, stood up and surveyed the damage. Thankfully there was none on the bike. Stella was as shiny and pristine as ever. My arm and leg, however, were another matter, but grazes heal. All in the name of a shiny bike! I am just grateful that no-one was about to see! Another ride done, another training session complete, another day closer to peak fitness and racing! ‘Pedal’, not ‘peddle’ – 100 times! Sorted, thanks! At least I was consistent!